Intel's next generation of CPUs will include powerful integrated graphics processors branded as "Iris"  a change that could help lead to even thinner and more powerful MacBook Pros with longer battery life. The fact that Intel has chosen to give its graphics processors a less generic name this year, beginning with the new Haswell series of chips, could indicate the company wants their mobile processors to be taken more seriously. Much like Nvidia's GeForce brand and AMD's Radeon brands represent those company's respective graphics technologies, Intel is now using the name Iris to pitch what it believes is a premium-level GPU. While Intel's integrated graphics have been gradually improving over the years, most serious users still see reliance on integrated graphics processing as a negative. Take, for example, last year's MacBook Pro with Retina display models. Apple started off with a 15-inch model that had its high-resolution display driven by a discrete Nvidia GeForce graphics card. But that same power couldn't be crammed into the 13-inch model, which debuted later in 2012 featuring only integrated Intel HD Graphics 4000. That's why Intel Iris is likely to be particularly meaningful for Apple's anticipated 2013 update to its 13-inch MacBook Pro. AppleInsider noted in its review of the 13-inch Retina model last year that one of the most disappointing aspects of the notebook was the lack of discrete graphics, forcing users to rely solely on Intel's integrated graphics. But with Iris, Intel has now signaled its next generation of processors will offer integrated graphics that can more directly compete with the likes of discrete hardware from Nvidia and AMD. 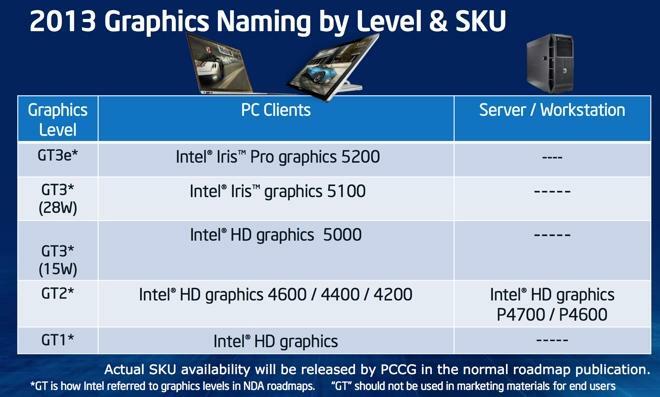 As noted by AnandTech last month, Intel plans for its high-end Iris graphics option in Haswell to compete with Nvidia's GeForce GT 650M  the same discrete GPU currently found in Apple's 15-inch Retina MacBook Pro. Further solidifying the premium nature of Iris is the fact that the brand will only apply to Intel's most powerful graphics solutions. 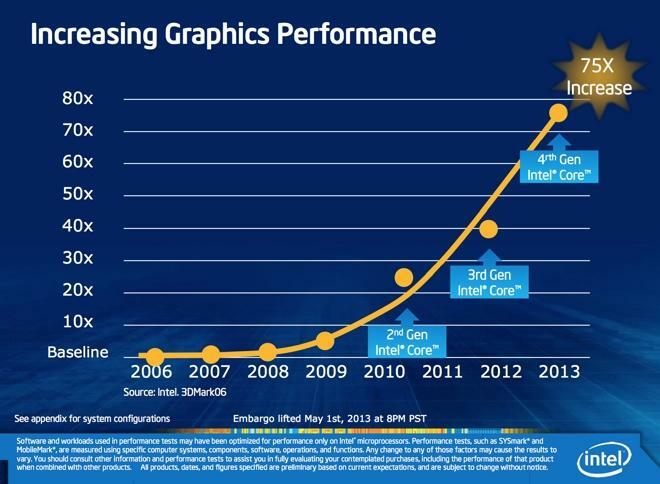 The company's low-end graphics processors will retain the generic "Intel HD Graphics" branding. But the high-end 28-watt GT3 graphics level will be known as Intel Iris Graphics 5100, while the top-of-the-line GT3e will be identified as Intel Iris Pro Graphics 5200. Iris Pro, in particular, will include 128 megabytes of eDRAM, helping enable it to offer more than twice the performance of the previous generation Intel HD 4000 graphics. Intel's premier GPU will be restricted to quad-core processors, which currently come by default inside Apple's 15-inch MacBook Pros. Iris graphics will also likely be another way for Apple to differentiate its MacBook Pro notebooks from the thinner, lighter and less powerful MacBook Air models. Intel's new Ultrabook-class Haswell chips, which typically power the MacBook Air, will not offer Iris-class graphics. Instead, they will feature the less powerful Intel HD Graphics 5000. Even still, Intel's own tests show that the new Intel HD Graphics 5000 will offer a 50 percent improvement in performance over the 4000-class graphics found in last year's Sandy Bridge processors, suggesting the Haswell upgrade will be meaningful for Apple's next MacBook Air models. And in a win for all users of Intel-based notebooks, Iris comes coupled with the power-saving enhancements made to the next-generation Haswell CPUs. That means it's likely fewer users will require discrete graphics in their notebooks, allowing battery life on portable PCs, such as Apple's MacBooks, to further increase. Apple is expected to introduce Haswell-powered MacBook models at the company's annual Worldwide Developers Conference in June. According to well-connected insider Ming-Chi Kuo of KGI Securities, Apple is likely to begin shipping new MacBook Pro and MacBook Air models with Intel Haswell processors before the end of the June quarter.